Vintage cognacs are extremely rare - the product of a single year's harvest and almost always from a single vineyard. Each is therefore unique, a never-to-be-repeated combination of the soil, the weather, the grape, the skill of the distiller and the subtle combination of oak, temperature and humidity in an ageing cellar. Usually associated with less refined, earthier cognacs, this Fins Bois from the Aulnay area of the Charente Maritime to the North West of Cognac is elegant and distinguished, thanks to the high chalk content of the vineyard. Now developing the classic aromas of significant age. A fine example of the Segonzac vineyards on the Western side, towards Angeac-Champagne, at the heart of the Grande Champagne. Bursting with flavours and a well-developed rancio. 99.99% of all cognacs are used as the building blocks of blends, alongside dozens and even hundreds of other cognacs of different ages and origins, each hopefully bringing its qualities to the final blend while hiding its shortcomings from view, in order to create a consistent product over time. But with vintages there is nowhere to hide. At almost 40 years old, this is a superb expression of the Borderies - the smallest of the six growing areas - from a vineyard to the North of Cognac in Cherves-Richemont, aged in a cellar of no more than average humidity. The 1967 harvest is generally considered to have been average at best, but this cognac from the commune of Verrières to the south-west of Segonzac stands out as one of the rare true successes of that vintage. French law requires that flawless documentation tracing the origin and subsequent ageing of a cognac be available in order to claim a specific age on the label. With stocks of old eaux-de-vie laid down over many generations of the Prunier family, the authenticity of these cognacs can be verified in the registers at our offices in Cognac. In each case, the statement of age refers to the youngest cognac in the blend. All our vintages are guaranteed free of colouring, sugar and le boisé (added wood extract), although these are permitted. They have neither been chill-filtered, nor reduced from their natural cask strength. In this way the spirit can be enjoyed exactly as it left the barrel. The Prunier Paradis contain cognacs from every decade since the 1900s - many of them certifiable vintages. 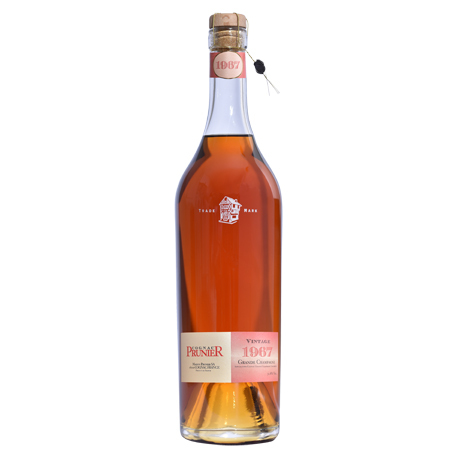 The current doyen in terms of year of harvest, although far from our oldest cognac, is a Grande Champagne from the year 1900, placed in demijohns in 1958. Periodic releases of these exceptionally rare eaux-de-vie are planned to mark important dates or anniversaries of significance to our customers. Should you wish to enquire about the availability of very old cognacs generally, or about specific vintage years, please contact us either by email to info@cognacpruniertravelretail.com , or using the contact form here.